What is a in Digital subtraction scan? 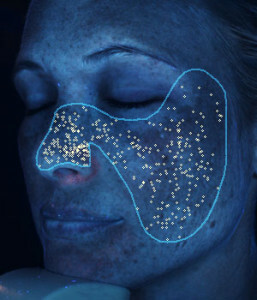 The DSS is a in depth Skin Analysis, the first skin care photographic imaging tool that provides clinical measurement of surface and sub-surface facial skin conditions. This is new technology that makes it possible for a client to receive facial rejuvenation and skin care treatments designed specifically for their unique complexion profile. The damaging effects of excessive sun exposure to the skin. Design highly targeted treatment protocols according to your results. When should one do an in depth skin analysis? The natural ageing process is a continuous process that normally begins in our mid-20s. Within the skin, collagen production slows, and elastin, the substance that enables skin to snap back into place, has a bit less spring. Dead skin cells do not shed as quickly and turnover of new skin cells may decrease slightly. While these changes usually begin in our 20s, the signs of intrinsic ageing are typically not visible for decades. Texture measures the skins smoothness by identifying the hills and valleys of the skin. 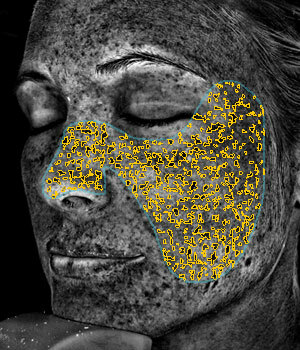 Raised areas are pimples, milia, blackheads, dead skin cells, shown in yellow. Indentions are fine lines, open pores, open hair follicles shown in blue. Basic exfoliation will help slough off the dead skin cells and smooth the overall texture of the skin as well as allow additional products to be better absorbed and utilized. 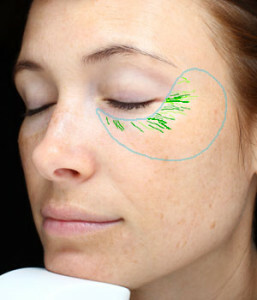 Blue lines indicate fine lines and that anti-aging product should be used. Fine lines are easier to address than wrinkles. Wrinkles are furrows, folds or creases in the skin that increase overtime as a result of sun exposure. Wrinkles are associated with decreasing skin elasticity. Wrinkles are identified by their characteristic a long, narrow shape or line. *On the 6.0, the light green are fine lines and the dark green lines are deeper wrinkles.What should I Do? The eye area is thin delicate tissue. Start using eye cream early because we age there first. Look for ingredients like hydroxyl acids, Vitamin A peptides and antioxidants. Pores are the circular surface openings of sweat and oil gland ducts. The VISIA system distinguishes pores from spots based on size. Pores are much smaller than spots. *This does not indicate clogged pores. Clusters of pores mean that you could have oily/blemish prone skin. Proper cleansing . Be sure to cleanse for 60-90 seconds and use small circular motions across the face. Remember to cleanse around the nose which is a common place to see clusters of pores. Protect and repair. First and foremost always protect the skin with a sun protectant, minimum SPF of 15. Second, use reparative products containing high doses of antioxidants to repair free radical damage. Brown spots signal melanin concentrations on or beneath the skin. 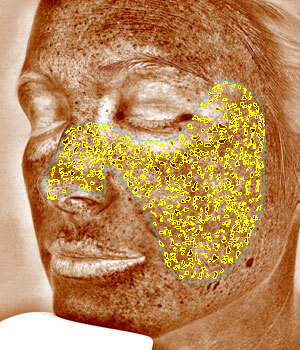 They represent various forms of hyper-pigmentation such as sun damage or melasma. This profile can also highlight moles and dark circles around the eyes. The goal is to break apart the melanocytes through cellular turnover. 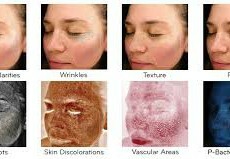 Creating healthy new cells will break apart the hyper pigmentation. Red Areas are weakened and broken capillaries. This profile shows sub-surface vascular conditions such as spider veins, rosacea or acne. Some things that affect our capillaries are smoking, caffeine, alcohol, sun damage, temperature change and spicy foods. Work to strengthen the capillaries flood the skin with antioxidant support. Porphyrins are natural bacteria and oil. The bacterial excretions can become lodged in pores and lead to acne. This score varies from person to person and it is ok to have a natural level of bacteria. Side-by-side comparisons and quantitative analysis can be done, thereby tracking the progress of your targeted treatment programme over time and staying connected with your aging goals as you consider the possibilities of aesthetic treatments and specialised skin care.